In a word: Darned good Mo' Bettah. JM ate Jim's crabcakes with a root beer. John ate the crawfish with cream sauce. Nichole ate the BBQ beef po'boy. We had a slice of fudge pie and took a praline to go. The bill was $40, or $13.33/person, plus tip. JM gave New Orleans Take-Out an A; Nichole gave New Orleans Take-Out an A-; John gave New Orleans Take-Out a B (see our grading rubric). We figure we could have benefited from repeat visits to New Orleans Take Out. The menu is broad, and our three choices were each underwhelming in either quantity or quality. This was surprising, given the great reputation NOTO has. (Maybe it just takes practice to find the best parts of the menu - comments and recommendations welcome below). NOTO is very Madison, in that it somehow pulls off being simultaneously snooty and yet just a little sloppy. The counter staff was aloof yet helpful in explaining the menu. For example, once they characterized the "New Orleans Gold" section as "fried dinners" the idea got a little tarnished. (The fried cod dinner, however, is popular.) Each night's specials look good, most notably the Saturday shrimp etouffee that's offered "too hot to eat or just too hot." But we got what we got, and JM did best. His full order of crabcakes seemed, frankly, a little petite for $12 and made us wonder what a half order of three cakes would be. At first bite, however, they revealed themselves to be a near-religious experience. Each mouth was an explosion of sharp spice splashed against tender crab and hot oil. He only regrets missing the fresh-squeezed lemonade because he was distracted by the root beer. John found his crawfish in cream sauce good. The cornbread was good enough, but it took him too long to figure out that the dish developed a real spicy kick once he ran out of rice. "Oh well," he opined. The BBQ beef po'boy was huge, but Nichole ate the whole thing. It was basically cubed beef and sauce on a toothsome roll. The beef was chewy, and the sauce was sticky/tacky and dense. It had a heat that as barely noticeable at first, but gradually built to a comfortable warmth. 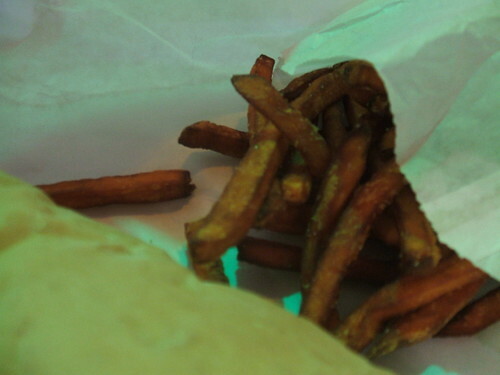 The sweet potato fries were A+, thin and crispy. The slice of fudge pie was pretty much a brownie. The praline we gifted to a praline fan, who said it was great - creamy, not at all grainy as sometimes a praline can be. It had great flavor and was a perfect size - large. NOTO is a place you can say "no" to, but it can be a go-to place for some good NOLA nosh to go because the food is better than so-so. Pralines make my brain hurt. Actually, so does that last sentence. I would recommend the crawfish po' boy with creole sauce (you have to ask for the sauce). It's pricey, but worth it. The red beans and rice really needs to be side dish IMO. I often like to get a big order of catfish and the red beans and them split with someone else, so we each get a little more variety. The red beans and rice is my favorite, with or without sausage. I have to agree with John on he half-order red beans and rice with double sausage. Good stuff. We've eaten here at least 5 times and I gotta say it's pretty mediocre and overpriced. 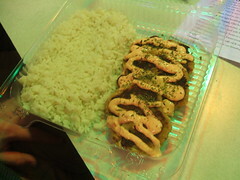 The portions are pretty small (until you add a heap of inexpensive rice) and the quality is massively inconsistent. Any one of those should set you up fine. NOTO on Fordem Ave. is a sweet deal considering the quality of the food and the affordable price. You get what you paid for. And when comparing it to other restaurants with the same to offer, it's actually cheap. Plus everything is homemade, except the french bread. A half-order of crab cakes? One lonely little cake, very good tasting, but not worth the price. Hand-squeeed lemonade? Pretty good, pretty tart. Don't even bother with the Oyster Po-Boy - dipped in cornmeal but never touched a fryer that I could tell. I like fresh oysters but that did not work. Overpriced, so-so. We eat there once a year for the red beans & rice, and to remind us why we don't go back more often. Just finished off my first taste of NOTO. 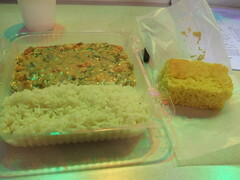 Red beans and rice with double sausage and a piece of corn bread, half order. Glorious, thanks to all who recommended it. Thanks for all the recs everyone! I just had the red beans and rice with dbl sausage. First red beans and rice for me. YUM! This will make a great addition to "what should we eat tonight?" As a Cajun/Creole afficianado and cook, I agree with a previous comment that the food is pretty mediocre. The stuff I cook is way better and much more authentic. The red beans and rice are nothing like what you would get in the Gulf area. Shrimp creole isn't the same without the larger gulf shrimp--and more of them too! Etouffe does a good job with its heat. I keep thinking I should open my own Cajun/Creole restaurant. I lived in New Orleans for three years. I never found a red beans and rice as good as NOTO. I encourage the writer of this review to come to the original New Orleans Take Out on Fordem Ave. 30 years of creole food. The only authentic place in the Midwest.